High-quality clear vinyl sleeve. Stick pouch on any ferrous metal surface with the American-made flexible rubber magnetic strips applied to the back. Attach to racks, attach to machines and equipment and easily move from place to place as needed. 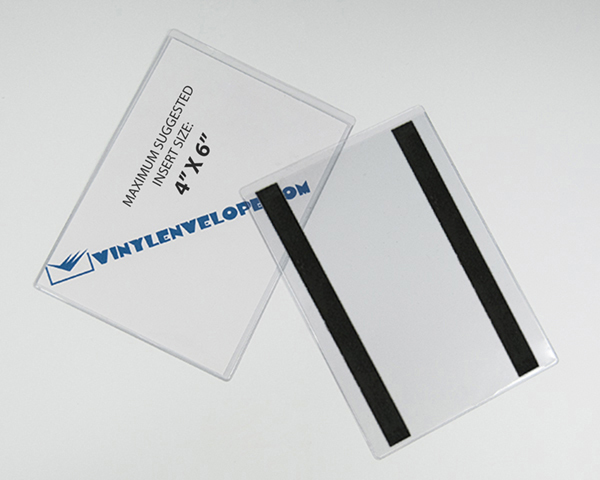 Made from heavy 8-gauge clear material on the front and back which works well with bar code scanners. Why are our prices lower than what you see elsewhere?. Because we are the manufacturer of this product so you get more for your money. Store, display or protect your documents or other items. There are endless uses for clear magnetic vinyl pouches. This vinyl envelope is perfect to fit a 4'' x 6'' insert. Other sizes available. Compare this magnetic vinyl envelope for a 4" x 6" card with two heavy-duty American-made magnetic strips to ULINE Model No. S-3833 (Magnetic Vinyl Envelopes - 4 x 6") which sells for $0.82 ea! (as of 11/30/2017). Save up to 35%!